Robots.txt is important on every website or blog because this file will be submit on Google Webmaster tool, this process instruct the google web crawlers on how to index and crawl your website in the search results. Robots.txt is a text which contains few lines of syntax for web crawlers. It is saved on the root directory of the website file system. My version of robots.txt is divided into five sections. Before we add to blogger admin, Let’s read the definition of each of them. If you have of you with knowledge in programming, asterisk is the nature of character ‘*’ (wildcard). These specifies that this portion (and the lines beneath) is for all for incoming spiders, robots, and crawlers. will never be crawled and indexed. This code is for Google AdSense robots which help to serve better ads on your website. Either if you have AdSense ads on your blog or not simply leave it there. This code refers to home page that means web crawlers can crawl and index our website or blog’s homepage. This code refers to the sitemap of your blog. By adding the sitemap we are simply optimizing our blog’s crawling rate, meaning the web crawlers scan the robots.txt file and they will find a path to our sitemap where all the links of our published posts updated. 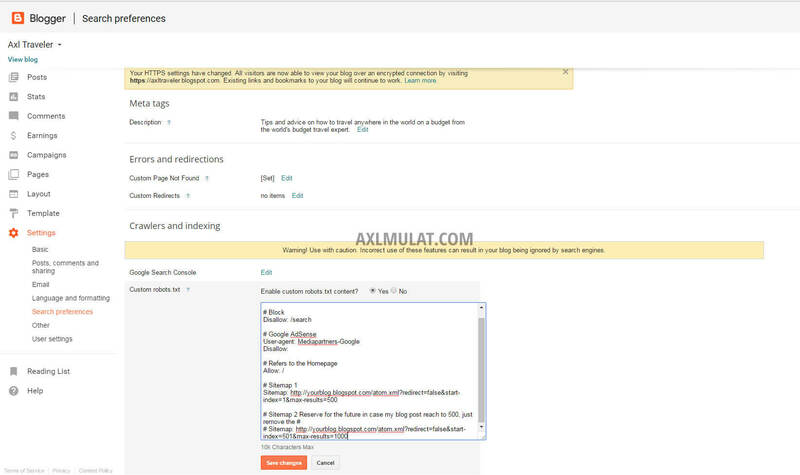 Because blogger xml sitemap generated 1 – 500 per atom url, to continue the number of post for atom just add a site url atom for 501 – 1000 and so on..
Go to ‘Blogger Admin’ -> ‘Settings’ -> ‘Search Preferences’ -> ‘Custom robots.txt’ and Add the text and Save Changes or See the screenshot. After adding the Custom robots.txt you try to preview in web browsers..